If you have recently made the choice to use dental implants to treat your tooth loss, you are making a wise decision. Dental implants are the most preferred option to treat tooth loss because they offer a long-term solution. Not to mention they look and function very similarly to your natural teeth. However, unlike other forms of tooth replacement, you will have to undergo a surgical procedure. Since the process to receive dental implants is more invasive and complex than other forms of dental prosthetics, many are concerned about the procedure. As a dental implant specialist in 43725, Dr. Lee is here to put your worries at ease with a breakdown of the process. To benefit from dental implants, you will need to undergo an extensive consultation to see if dental implants are right for you. During the consultation, the health of your gums and underlying bone will be accessed. You must have healthy gums and adequate bone density to support the implant. In addition, you must have minimal risk factors for implant failure, which will involve evaluating your medical history and lifestyle habits. If Dr. Lee determines dental implants are right for you, he will create a comprehensive treatment plan to replace your missing teeth. The first phase of treatment will involve placing the implant post. Using a local anesthesia, an incision is made into the gum to allow for the biocompatible post to be inserted by drilling a hole into the jawbone. To ensure the proper placement of the implant, images will be taken. Then, your gum will be sutured closed to allow the healing process to begin. Over the next several weeks, your jawbone will fuse to the implant post to provide a sturdy foundation for the prosthetic tooth. After your jawbone has healed to the implant, you will undergo a second procedure to attach the healing caps to the implant post. A small cut is made in the gum to expose the implant. Then, a metal healing cap, also known as an abutment, is placed on the implant to allow the gum to heal around the abutment. About two weeks after having the abutment placed, you will undergo the final phase of treatment, which involves placing the restoration. 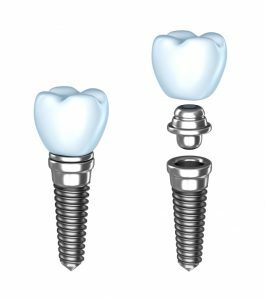 The permanent crown will be attached to the implant post via the abutment to replace your missing tooth. In just three simple steps, you will regain a complete smile and oral health with dental implants. As an oral surgeon in Cambridge, Dr. Lee is able to perform dental implant procedures to replace your missing teeth. Dr. Lee provides the surgical placement of your dental implants to ensure the success of the procedure while striving to provide a stress-free and comfortable procedure. Using the most advanced technology and procedures, Dr. Lee will provide the customized treatment plan you need for successful tooth replacement. If you are ready to benefit from dental implants, contact Muskingum Valley Oral Surgery to see if you are a candidate.